The widespread and indiscriminate use of plastic has become an environmental hazard. Every year, we throw away enough plastic to circle the earth four times. Much of that waste doesn’t make it into a landfill, but instead ends up in our oceans, where it’s responsible for killing one million seabirds and 100,000 marine mammals every year. According to estimates, oceans would have more plastic than fish by 2050. One of the major sources of pollutant is single-use plastic bottles, as a million bottles are bought around the world every minute. Most plastic bottles used for soft drinks and water are made from polyethylene terephthalate (Pet), which is highly recyclable. But efforts to collect and recycle the bottles to keep them from polluting the oceans are failing to keep up with the quantum jump in use across the globe. If water was dispensed like cash at water ATMs only, the earth would be a better place. It would help getting a quick drink of aqua while reducing our carbon footprint simultaneously. With the recent announcement of plastic ban, companies have already taken a step and a slow revolution has been seen taking place at railway stations and public areas. The UN theme for World Environment Day 2018 is ‘Beat Plastic Pollution’. As India is the host country this year, companies here have taken further initiative to install water ATM machines to provide access to clean drinking water. Started in 2014, Swajal is one of the most advanced solar-powered water purification systems in India. Swajal helps replacing tons of plastic annually on road by promoting paper cups. “It takes almost 400 years for a plastic bottle to decompose. It’s an environment crisis that needs to be addressed. A million plastic bottles are bought every minute around the world and India is witnessing a strong growth. We need to start shifting to a circular economy to save the environment from such a crisis,” said Advait Kumar, co-founder of Swajal, who left his career in the US and came back to India to pursue the mission of giving people access to affordable and clean drinking water. “Not only do water bottles generate plastic waste but they can also be unhealthy for storage. We are intentionally creating a model that discourages plastic and promotes reuse of water containers and thus we are reducing 420 tons of plastic every year. We think that our model of distributed water ATMs will be the future for drinking water. 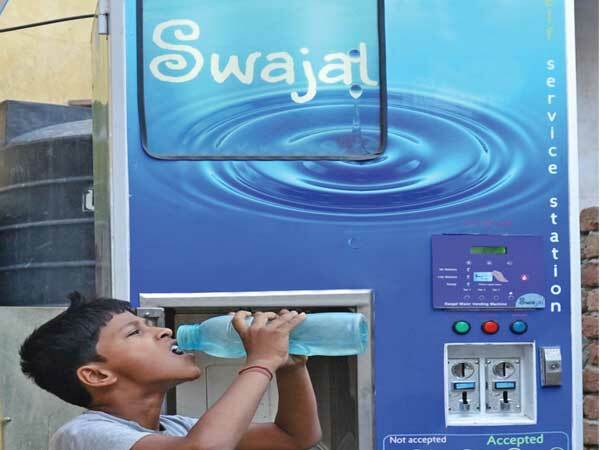 Swajal’s technology is built around IoT, processes, automation, quality control on each step, and comprehensive data analytics in order to bring the best water in the safest and most efficient way,” he added. With its presence in more than 14 states, Swajal serves over 4 lakh people across India daily. “Water ATMs are an affordable, accessible and a reliable way of getting clean drinking water. There is already a shift in consumer behaviour, whether it is the office goers who travel in metro or it is the people who are traveling through train for a long journey. A basic everyday need has to be affordable and water ATMs is the best way to provide people with quality drinking water,” said Kumar. While environment-friendly steps are taken in the area of drinking water distribution, there is a reverse trend in milk distribution. Earlier, people used to carry cans to fetch milk from the machines installed in Mother Dairy booths, but now purchase milk in plastic packets from next door kirana shops and carry them in another plastic bag. Although availability of milk in plastic packets make like convenient for people, but used plastic packets and carry bags making the already aggrieved plastic pollution problem further worse. It’s time to look into the growing environment-unfriendly milk distribution system and decide if we can put the future at stake just for convenience.